Ferries to and from Milos Island - The definitive tourist guide portal to the island of Milos, Cyclades, Greece. 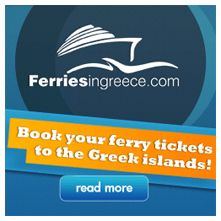 You may use the form below to book ferry tickets to and from Milos, or any other destination in Greece. Web site audio: Excerpt from "Wandering Flame" — Composition by Gunnar Spardel, featuring the ethereal voice of Amethyste.